Basic event budget plan – Some events in life are unplanned, and you have to deal with the impact, but there are many other events in the lives of most, which can benefit from proper planning that results in less stress for the organizer and a more enjoyable or successful gathering for the participants. 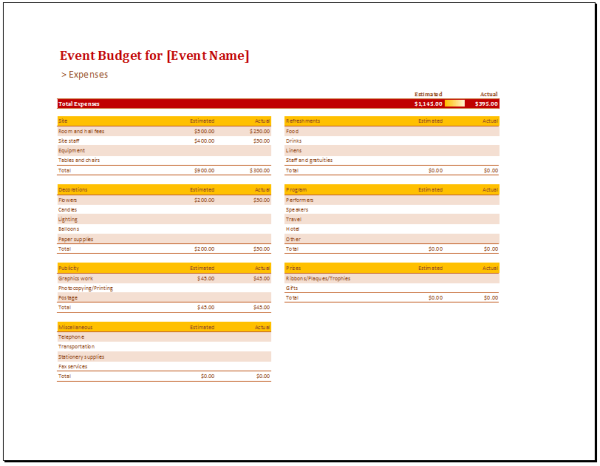 The Event Budget Template is a good place to start. With this template, an event organizer can list the various items that fall under specific topics, such as site or location, decoration, refreshments, entertainment, etc. The template provides a place to enter the estimated cost, which is used in the initial planning stage. Then once all the items that are relevant to the event are listed, the planner can begin determining the actual cost of each category. In most cases, some people will be under-estimate on some items and over-estimate on others. The planner will reveal those areas and in addition will provide the total estimated cost and the actual cost. The planner can also be used to stage an event based on the estimated costs. It can then be used to list the actual cost for each category. In either scenario, the planner can see how much the estimates exceeded or came in less than the actual amounts. This provides a training tool to show how real costs can differ from estimated costs, which will give the planner a better understanding of the expenses when he plans his next event.